You guys know me. I’m not a chocolate guy. We don’t review a lot of chocolate, and when we do, it’s usually Matty doing the writing. I strongly dislike truffles, and chocolate bars are only on my craving radar if they’re chock full of yummy extras. I like chocolate per se, but it’s just not high enough on my favorites list to eat that often. Toffee however? That’s a different story. I’m talking about hard, buttery, slightly salty toffee. I love it. But not all toffee is created equal. Take See’s Candy’s take on it for instance: garbage. Sorry Sees, but yer slippin’. Almond Roca? Meh. No, I don’t want or need nuts on my toffee. But chocolate? High quality chocolate? Yes, please. 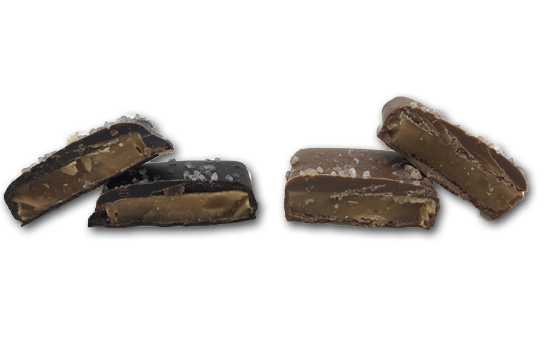 It adds a creamy rich layer that is just perfect with the hard toffee. What seals the deal though, is this salt. 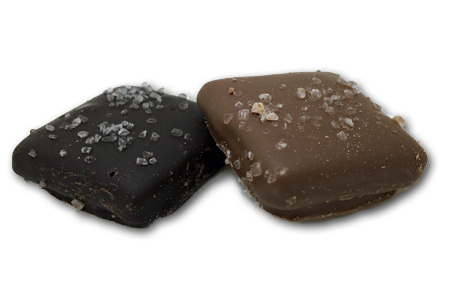 Sure, these days every piece of boutique chocolate seemingly has sea salt on it-and I’m not complaining, that’s a good thing. The salt strongly helps to pull out & accentuate the other flavors. But some salt is too fine, so it doesn’t add to the texture party. Other salt is too sparse, so it doesn’t season properly. The salt on these though? Absolutely spot-on perfect. I spoke to the guys at CandyJar.com to find out who made these incredible things they sent me-and much to my surprise, they told me they’re made by a chocolatier who supplies Albanese candies. You remember Albanese, right? They make what are possibly better gummy bears than Haribo. I said possibly. Anyhow, they’re a wonderful company, and that’s where I got these. I don’t tend to share these with people because why would I? I actually love the fact that these are from a pretty major candy company and not a local place. That means we can get them regularly, and most likely, that the recipe won’t change. Anyhow….what are you guys still doing reading this? Click the damn link below and buy yourself some already. If you’re not gonna take my advice on this one, then WHEN WILL YOU? I promise, they’re beyond worth it. Wow. HIGH praise. Gonna have to try me some. I’m buyin’ right now. Can they deliver by drone?